Thanks for the comments, Elizabeth and Lynette!! The "big" squares (which are really only about an inch wide and tall) were knit on 5s. The book suggested 6s, so I started with 7s, but that was way too big. I really enjoyed knitting with the wire, though it certainly took some getting used to. The hardest part was getting the wire to come off the "hank" properly. That was a big pain. But if I could figure that out, I'd honestly love to knit a cuff bracelet out of this stuff! I started knitting the crepe-paper crown out of Alterknits yesterday. I was enjoying it and did about two or three rows when a stitch in the row below the current row ripped. End of knitting with crepe paper, at least for the time being. But I'd like to try it again and make a crown for Ellie. I was using the leftover spring-green crepe paper from her first birthday party a few weeks ago. In the realm of knitting with yarn, the bearish creature now has two legs, and I bought stuffing for him/her last night. 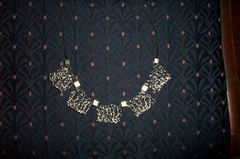 The big squares are knit with 28-gauge sterling silver wire. I don't know when and where I'll wear this, but I sure do love it. The bearish piece has a head and a leg and a half, all connected to his torso. I'm thinking of leaving off the ears and face, a la the shop model in the knitting shop (Arcadia) -- one of the sister/owners noted that he looked like a Keith Haring creation, which appeals. Ellie liked it, too. We'll see. Let's work on arms, first. In lieu of my own photos, here's a link to two things that caught my eye in today's New York Times. Light-hearted, non-political things. Find the "Pulse" Slide Show (in the Sunday Styles section) and check out the good-deed-doing knit flowers, then the needles with lights in them for knitting in movie theaters! Istuffed it with some yarn that I knew I'd never use. I also have the body and two sleeves complete on a pullover in All Seasons Cotton for her -- it needs assembling and collaring. 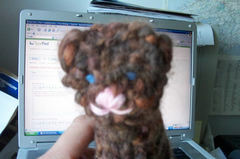 Now I'm working on a big bear-like creature in Blue Sky Alpaca bulky. It's on 15s. Am also finishing a black sock for Clark on 2 1/2s. Ah, knitting! I didn't know what I had till it was gone.